Wolf and Jolion’s method is a quite good one for image binarization and its code is online. There is a web demo of the method. In comparison with the original command line tool, it is somehow visualized, but the image size is limited. The Windows version of Calculix by bConvergent has not been updated long and CalculiX GraphiX (CGX) in CalculiXforWin is also quite old. It is somewhat easier to compile CCX and there are building guides about that online, so this blog is only about compiling CGX with MingW. There is no dir.h in MinGW, but dirent.h can be a replacement. In readFoam.c and setFunktions.c, change #include <sys/dir.h> to #include <dirent.h> and struct direct *dp; to struct dirent *dp;. There are still utsname and strtok_r needed. Implements of the two for Windows can be found on Internet. GL_CLAMP_TO_EDGE is not defined in gl.h on Windows, so #include <GL/glext.h> should be added into extUtil.h. The GLUT provided with the source code of CGX can not be compiled on Windows, so remove those files from Makefile. Precompiled GLUT or FreeGLUT for Windows are easy to use. CGX with FreeGLUT 3.x will throw a “no display callback” error, so only lower version can be used. The compilation of libSNL in Makefile can not work on Windows. Those files have to be compiled manually, but that is easy. Reading result file on demand does not work properly on Windows, so int read_mode=0; should be changed to int read_mode=1; in cgx.c. The last step is to make Makefile include and link correct files and some other modification to make things work. Of course, if you do not want to do all these yourself, the built files can be downloaded directly here, and here is a larger package containing CCX and some other useful binaries. All these are 32-bit and that is a reason for what I have to compile them myself. The Methodist mission in Jiujiang (Kiukiang), China was sent by the Methodist Episcopal Church (abbr. MEC), a Northern American church and this mission played an important role in the modern history of Jiujiang City. Because of unifications with other Methodist churches, the name of this church changed to the Methodist Church in 1939 and now it is called the United Methodist Church. This article is written based on a few digitalized archives and the writer is not a Christian, so mistakes, including incorrect English usages, are certainly inevitable. If you have any information about this, please let me know. Pinyin system, the current standard system in China Mainland, is adopted to romanize Chinese names and old spellings used by missionaries were put in parentheses. However, for some Chinese, their English names are used here, because those names were more commonly used in missionary documents than their Chinese ones, while their Chinese names are also given. In 1847, MEC began its mission in China at Fuzhou (Foochow), the capital city of Fujian (Fukien) province. It resulted little for the first ten years and it took another ten years to make some progress in Fuzhou and nearby districts, then the church decided to expand its mission to other parts of China. Dec. 1, 1867, Virgil Chittenden Hart (1840-1904) and Elbert S. Todd (1845-1919) arrived at Jiujiang, which began the Central China Mission of MEC. They arrived slightly earlier than missionaries sent to North China, so Jiujiang became the first station of MEC out of Fujian, and the Methodist mission was the first Protestant mission entering Jiujang. Rev. Hart was the Methodist pioneer of almost the entire Yangtze Valley and the building named after him still stands on the campus of Sichuan University, where formerly was the campus of West China Union University, a Christian university. In 1869, for the first time a mission school was mentioned in the annual report of the mission in Jiujiang. Nov. 13, 1872, Gertrude Howe (1846-1928) and Lucy H. Hoag (1844-1909) arrived at Jiujiang, who were sent by the Woman’s Foreign Missionary Society of the Methodist Episcopal Church (abbr. WFMS). A school for girls was open on the first day of the next year. Dec. 1874, Letitia Mason (who married a Dr. Quine when no longer being a missionary), the first female medical missionary entering Yangtze Valley, after whom the hospital for women and children built at Zhenjiang (Chinkiang) later by MEC was named, arrived at Jiujiang. She did not work as a missionary long, but the medical work was carried on by several other medical women. It should be mentioned that one of them was Lucinda Combs Stritmatter (1849-1919), having arrived at Beijing (Peking) in 1873 as the first female medical missionary to China, who came to Jiujiang after she married a missionary in Jiujiang, Andrew Stritmatter (1847-1880). In 1875, a medical missionary William E. Tarbell arrived at Jiujiang and he opened a dispensary in July, but he left just the next year. Since then, there was no male medical missionary of MEC in Jiujiang for a very long time, though there might be some foreign physicians helping the work in Jiujiang for MEC. Also in 1875, there was a riot against the missionary activities and chapels and schools of MEC inside of the Jiujiang City Wall were demolished. The indemnity for all the losses was paid by the local government. At the end of 1876, Kiukiang Girl’s Boarding School of MEC moved to the southwest of Nengren Si (Ngn Ren Tsz), where the school, though have been merged with the boy’s school, still exists. After the relocation, the school was also called Mulberry Grove Academy. At the beginning of 1881, Thomas C. Carter opened a boy’s high school, named Fowler University, to mark appreciation of the Secretary of the Missionary Society, Charles Henry Fowler (1837-1908). This school was one of the earliest general schools supplying English lessons in China. Rev. Carter was forced to leave by his falling health at the end of this year and newly-arrived Carl Frederick Kupfer (1852-1925) took charge of the school. Also in 1881, the mission began to build on Lushan for a sanitarium. Later on, two missionaries of MEC, Edward Selby Little (1864-1939) and John Reside Hykes (1852-1921), especially the first one, bought a lot of land on that mountain to develop and made it one of the most famous summer resorts, with the name Kuling given by Rev. Little. In 1882, female medical missionaries in Jiujiang left and no more people succeeded, so the medical work of WFMS in Jiujiang discontinued. In 1883, the only missionary of WFMS then, Miss Howe conflicted with male missionaries and she resigned and left. However, she went to Chongqing (Chung-king) and worked there for WFMS. Her work at Jiujiang was taken by wives of male missionaries. In 1884 or 1885, Fowler University moved to the new site near the south gate of the City Wall, by the side of the Girl’s Boarding School, where the school still exists, and the quite imposing “University” was changed to “Institute”. In 1886, a riot against Christian missions happened in Chongqing. Missionaries of MEC there retreated to Jiujiang, when the confliction between Miss Howe and male missionaries seemed to be vanished and she worked at Jiujiang again. In 1888, Bishop Fowler (elected to the Episcopacy in 1884), who came to China to supervise the missions in China, thought it was improper to name the boy’s school at Jiujiang after his own name and changed its name to Kiukiang Institute. In 1889, two Chinese students Hu Qibing (Hu Chi-ping) and Yü Kaizhi (Yü Kai-chi) went to Germany to study in the Methodist Mission Institute at Frankfurt, probably the first to study abroad from Jiujiang. Hu Qibing graduated in 1893 and Yü Kaizhi unfortunately died there in 1894. In 1893, Kate Louise Ogborn (1862-1932) opened a Woman’s Bible Training School. In 1896, Ida Kahn (1873-1931, Chinese name: Kang Aide or Kang Cheng), an adopted daughter of Miss Howe, and Mary Stone (1873-1954, Chinese name: Shi Meiyu), a daughter of one of the first native pastors of the Central China Mission, graduated from the Medical School of Michigan University. They had probably never been in America before they went to the university four years ago, but their grades were always leading their class. They returned to Jiujiang in the fall and a dispensary was erected before the end of the year. These two of the earliest female graduates from Western countries came back when the Chinese reformists were advocating woman’s education and these two young doctors were widely introduced as the new models of Chinese women. Early in 1901, Kiukiang Institute was renamed to William Nast College, to memorialize William Nast (1807-1899), the founder and leader of German-American Methodism, in recognition of large contributions to this school from German-American Methodism. Rev. Kupfer, who had once been the president and who was from a German-American Conference, served as the president again. Only two years’ courses were supplied at the beginning and courses were like those in colleges in America in 1905, but after all this school could hardly be called a real college. Dec. 7, 1901, Danforth Memorial Hospital for women and children opened formally, funded by Dr. Isaac Newton Danforth (1835-1911) of Chicago to memorialize his wife Elizabeth Skelton Danforth (1843-1895) and supervised by Dr. Kahn and Dr. Stone. The hospital still stands at its original site with some old buildings. About 1903, some female missionaries in Jiujiang were appointed to Nanchang. Miss Ogborn opened Baldwin Memorial High School for Girls and Dr. Kahn opened a dispensary, which was later turned into Nanchang Woman’s and Child’s Hospital. About 1905, the Girl’s Boarding School was renamed after Sally Ann Rulison-Fish (1833-1902), who was a famous organizer of missionary societies and publisher of missionary periodicals then in Michigan. Sep. 1907, the new school building opened to receive students, and this building still stands. About 1907, the Woman’s Bible Training School was named after Ellin J. Knowles (1834-1929) and in 1911, the new school was ready for students. Its site was opposite to Danforth Hospital, but now no evidence of that school can be found there. In 1909, a Chinese, Yu Facheng was struck in the British Concession in Jiujiang by a policeman and died. Native Methodists tried to help the victim with their knowledge about foreign affairs and the Superintendent of Methodist Wuhu Hospital, Dr. Edgerton Haskell Hart (1868-1913), born at Jiujiang to Rev. Virgil Hart, was invited to Jiujiang to examine the body. It was stated in his report that the death was caused by the injury of the blows, but his testimony was discounted by the British Consul and the policeman was released for there was no sufficient evidence. In 1912, Kiangsi Mission was separated from the Central China Annual Conference and in 1917, it was elevated to an annual conference. In 1918, under the special condition of World War I, Rev. Kupfer, the President of William Nast College, was accused for his pro-German disloyalty. The church ordered him to retire and German and German-American people in this college was forced to leave. The plan of the college was also reduced, and it turned to be just a high school in 1920. After the school was degraded, some better-educated native teachers left. Yet the name “College” had not been changed until about 1928, when it was renamed to William Nast Academy. Sep. 20, 1918, Edward Carter Perkins (1875-1958) opened Water of Life Hospital. Its name was from the sentence he loved, “Whosoever will, let him take of the water of life freely.” The fund of building and maintaining the hospital was mainly from Dr. Perkins himself. Only men were received at the beginning because there had been Danforth Hospital for women, but after 1936 women could also come to this hospital while obstetrical cases should be turned to Danforth Hospital. This hospital now is the largest hospital in Jiujiang, at the place where it was founded. The old main building of the hospital and Dr. Perkins’ house still exists. In 1920, Dr. Stone, the Superintendent of Danforth Hospital, and Jennie V. Hughes (1874-1951), the Principal of Knowles Woman’s Bible Training School, conflicted with the board of WFMS. They resigned and went to Shanghai to found Bethel Church. Not a small part of the staff of the hospital and the school left with them. In 1927, it was demanded by the Chinese government that heads of schools must be Chinese. Cai Degao (Tsai Teh-kao) was appointed the first Chinese Principal of William Nast College, and Xiong Xiangxi (Hsiung Chiang-hsu) succeeded him in the next year. Hu Zihua (Hu Tze-hwa) was appointed the first Chinese Principal of Rulison-Fish School, and Grace Wu (Chinese name: Wu Maocheng) succeeded her in the next year. Rev. Xiong and Miss Wu headed the two schools long until early 1950’s. Beatrice Lee (Chinese name: Li Zhemin) was appointed the Principal of Knowles Woman’s Bible Training School, of which the younger sister of Dr. Stone, Anna Stone (1880-1906, Chinese name: Shi Anli), had been the principal before. Also in 1927, the primary department of William Nast College moved to Taling Street and became an independent school, William Nast Primary School. This school does not exist but one building is left. In 1938, because of the invasion of Japan, William Nast Academy moved to Dingjia’ao, Bishan, Sichuan (Tin-chia-ngao, Pi-shan, Sze-chwan) and Rulison-Fish School moved to Zizhong (Tze-chung), Sichuan, then to Suining the next year, where it collaborated with a part of Baldwin School which also came here and the local Methodist girl’s school, forming an associated school. The part of these two schools left in Jiujiang and Knowles Woman’s Bible Training School were associated. In 1939, three large Methodist churches in America, Methodist Episcopal Church and Methodist Episcopal Church, South and Methodist Protestant Church were united to be the Methodist Church. After the Pacific War broke out in 1941, Americans in the territory occupied by Japanese were interned. These people were repatriated to America in the next years, exchanged with interned Japanese and institutions owned by them were occupied by Japanese. When the war ended, Methodist schools moved back and hospitals opened again. In 1949, the Communist army crossed Yangtze River and the new government tightened the restriction against missionaries gradually. At the end of 1950, after America and China went to war, Methodist missionaries in Jiujiang were ordered to leave by the local government. These last missionaries were Mabel A. Woodruff, Dr. & Mrs. Perkins, Annie May Pittman, Deanetta & Elizabeth Ploeg (perhaps the list is not a complete one). In 1951, Methodist schools and hospitals were nationalized by the government and soon Rulison-Fish School was merged with William Nast Academy. The Methodist Church in China Mainland survived several years more, then it was absorbed into “Three-Self” Church, the official Protestant church in 1958. The heads of schools and hospitals built by the Methodist mission in Jiujiang are listed below, though these lists are not complete obviously. * At most times, more than one missionary supervised the educational work for girls in Jiujiang and it is not clear which one was the head of this school. Miss Howe is put in the table only because she served long in Jiujiang. * George Carleton Lacy, Edward Carter Perkins and Hu Qibing served as the acting one successively. When using 9-point stencil finite difference or finite element method, every vertex has 8 neighbors except ones on the boundary. In the picture in previous blog, every smallest square is a clique in 9-point grid. Regular 9-point grid is what Nested Dissection was invented for originally. 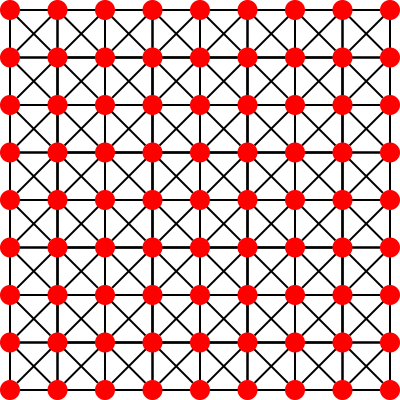 5-point grid and 9-point grid are quite different for fill-reducing. As the benchmark shows, MESHND performs very well except the very small grids for 9-point grid. Though MESHND is so good in this condition, further improvement can be achieved. For fill-reducing, minimal separators are essential. Original Nested Dissection, which MESHND implemented, uses horizontal or vertical lines as separators and for every subgraph, heuristically the line dividing the subgraph equally is chosen. Considering MESHND is so good for 9-point grid, it is acceptable to restrict the separators to be horizontal or vertical lines. But it is better to choose the line resulting minimum fill-in directly. This method can be extended to more general case. can be any component and is its separator. The object can be changed to operations in the factorization, which is the quadratic sum of nonzeros of all vertices. This is also included in the demo, though commented out. Minimizing operations leads to a different ordering but it will not be discussed here. The ordering shown in the demo is only one of many cases resulting minimum fill-in. When the grid is very small, AMD is better than MESHND. But the method proposed here surpasses both methods in all cases I have tested(Table 2, Table 3). The improvement over MESHND is very small (only 3-4 percent) for large square grid(Table 2). So in this case where Nested Dissection originate, though dividing the graph equally is not the best choice, it is only little worse than the best choice. When the grid is not square, the improvement is more significant as the aspect ratio increases(Table 3). It is interesting that relative difference between AMD and MEHSND also becomes larger as the aspect ratio increases(Table 3). The minimum fill-in of grid is . Regressing the result of this method, the minimum fill-in of grid may be . As pointed out, AMD is a good complement for Nested Dissection, not only when the grid is too small, but also when the grid is too slim. I suppose that the distance is important for fill-reducing, not only the size. A square is a disc for 9-point grid. In Nested Dissection, a disc is split into 4 smaller discs and every smaller disc is further split, which produces very good result. When the shape is different, maybe some other skills can be added to improve the result. A. George, Nested dissection of a regular finite-element mesh. V. Bouchitté, I. Todinca, Treewidth and minimum fill-in grouping the minimal separators. A. George, J. Liu, E. Ng, Computer Solution of Sparse Linear Systems. I tried to compile files manually and found only two points are needed. Comment out or delete the line #include <sys/resource.h> in gk_arch.h. Add 2 command options for GCC: -std=c99 and -DUSE_GKREGEX. If CMake is used, only the first is necessary.